The Tenluxe textile cleaning gun removes stains easily. Most oil stains or dust on textiles can be quickly cleaned with the cleaning gun, making hand-washing unnecessary. Particularly suited to ready-wear factories, textile factories and laundries with medium-to-load workloads. 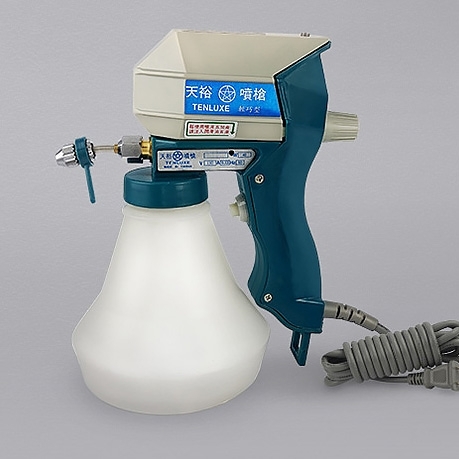 The cleaning gun reciprocates 60 times a second so its performance depends on design, construction and regular maintenance. 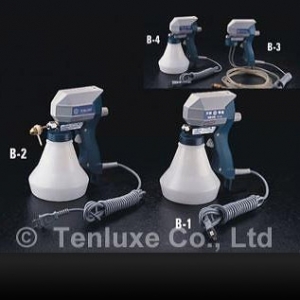 Each Tenluxe cleaning gun is made from hundreds of precisely engineered parts. Strict quality controls during assembly ensure the highest quality. Step 1 Hold down the trigger switch and the solvent will start spraying after 5 seconds. Keep a distance of 10 ~ 20 cm from the target. Adjust solvent strength by changing the distance. Step 2 The volume can also be adjusted. Rotate volume control knob anti-clockwise to increase volume. Rotate clockwise to reduce volume and spray strength. Step 3 Clean from the edges first. For lighter solvents, reduced the volume slightly. If volume is too high actual spray strength is reduced. Step 4 If the nozzle head is blocked, remove the nozzle head and clear obstruction with a toothpick or another cleaning gun. Do not use a hard metal needle. • The pump cylinder (see Drawing C) includes wear-resistant copper lining (C ①) and chromium ring (C ②) to deliver a service life of more than 100 million cycles. • The oil storage ⑥ allows constant lubrication of the pump to extend piston life. 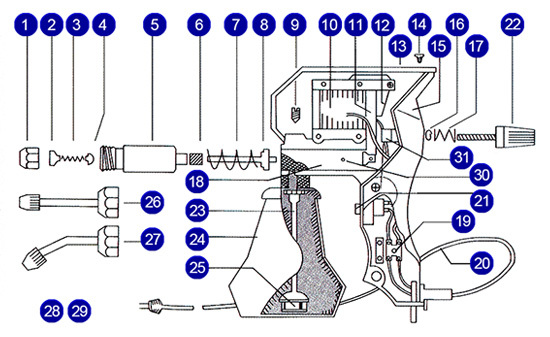 • The piston spring (C ⑤) isolates the spring and liquids (C ④) to prevent corrosion. • Distinctive impact-resistant nylon housing for thermal protection and ease of cleaning. • A variety of nozzles for different applications are available. 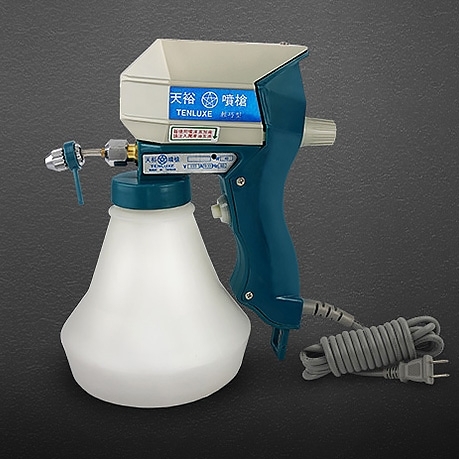 At the end of each working day or after a single use, spray a mixture of solvent and 5~10% machine oil to prevent rusting of the pump cylinder. 5 drops of lubricating oil should also be applied to the lubricating hole after every 5 gallons of solvent sprayed.